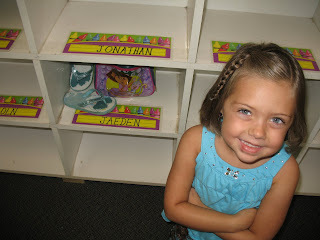 I don't know when Jaeden got to be such a big 4 year old, but today she went to her first day of preschool. She is going to Capital Gymnastics so during her preschool day she gets a 45 min. gymnastics lesson. Double bonus for our buck. She said she had so much fun and can't wait to go back. 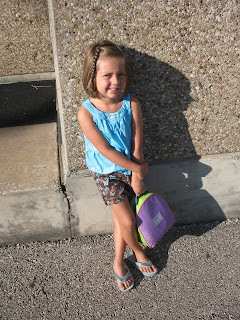 Today was Easton's first day of school too! I don't know when they got so big either! Love the hair cut! Glad to hear she had such a great time. Tyler doesn't start till next week, and I am totally ready right now! Super fun! Go Jaeden :) I am glad it went so well today. What a big girl!! I am jealous, I always wanted to go to capital gymnastics!! :) She is so cute and her new haircut is so super cute! I love her haircut! She is such a cutie pie! How fun to have a gymnastics lesson as part of preschool, think I can go?! How fun! She looks so cute. I think Thursten's oldest went there for preschool. Cool Idea! It was so fun seeing you guys this last weekend! I can't believe how big she is. I know we laughed about this, but seriously, where did the time go from our taco bell lunch break and being excited that you were just barely pregnant!?! !